Please join us in congratulating Michael G. Owen and Reneta L. Green-Streett on their admissions to the Supreme Court of the United States! 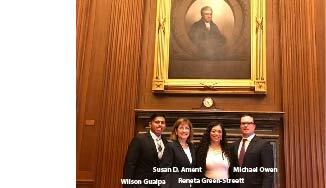 On May 22, 2017, Mike and Reneta were sponsored by Susan D'Alonzo Ament and the Honorable Randy J. Holland, retired Justice of the Delaware Supreme Court, who also moved for their admission in front of the Supreme Court of the United States. Morris James attorney, Wilson Gualpa, was there for moral support.